FiberMend is different from other fiber formulas because it contains SunFiber®. 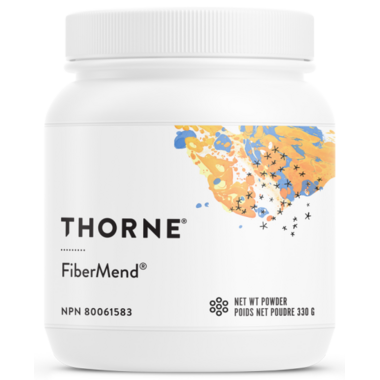 FiberMend is a powder blend of plant-based, water-soluble fibers, formulated to promote regularity and healthy glycemic control,enhance nutrient absorption, and help maintain optimum digestive function. FiberMend combines SunFiber – a partially hydrolyzed guar gum fiber – with rice bran, larch arabinogalactan, apple pectin, prune powder, and green tea phytosome to provide an effective prebiotic fiber formula that is well-tolerated and easy to use. Because FiberMend is tasteless and odorless, and readily dissolves in water, it can be mixed easily with a morning smoothie or a preferred beverage. Adults: Mix 2 level scoops with 8-10 oz. of water, juice, or preferred beverage daily or as recommended by your health-care practitioner. Take at least 2 hours before or after taking other medications. Do not use if you are pregnant or breastfeeding. For use beyond 3 months, consult a health-care practitioner. May cause GI symptoms such as flatulence, cramps, gas and diarrhea. Consult a health-care practitioner prior to use if you have a liver disorder or develop symptoms of liver trouble (such as abdominal pain, dark urine, or jaundice). Consult a health-care practitioner prior to use if you have an iron deficiency. Consult a health-care practitioner prior to use if you have diabetes. Consult a health-care practitioner prior to use if you are taking medications which inhibit peristaltic movement (e.g. opioids, loperamide). Consult a health-care practitioner prior to use if you have symptoms such as abdominal pain, nausea, vomiting, or fever (as these could be signs of abnormal constrictions of the gastrointestinal tract, diseases of the oesophagus and/or the superior opening of the stomach (cardia), potential or existing intestinal blockage, paralysis of the intestine, megacolon, faecal impaction, inflamed bowel, or appendicitis). Consult a health-care practitioner prior to use if you have difficulty swallowing. Consult a health-care practitioner immediately if you experience chest pain, vomiting, or difficulty in swallowing or breathing after taking this product. May have bulk-forming laxative effect on bowel function. Do not use if you are experiencing a sudden change in bowel habits that has persisted for more than 2 weeks, undiagnosed rectal bleeding, or failure to defaecate following the use of a laxative product.